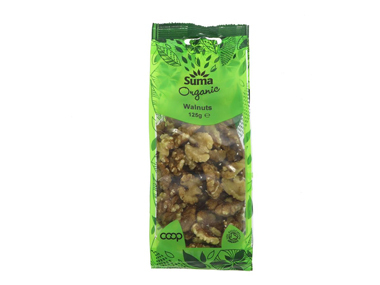 Buy Suma Organic Walnuts 125 grams in the UK from our online shop or directly from our independent Scottish store. You can use large, round courgettes or small round squashes for this seasonal recipe. I have used an egg to make the filling more firm, but you can leave the egg out to make it suitable for vegans. This recipe contains 2 handfuls walnuts, chopped. September is the season for tomatoes! Use them in salads, tomato soup or in pasta dishes, like this gluten free, dairy free and egg free fettuccine meal. This recipe contains 75 gm walnuts. A vegetarian walnut and lentil loaf full with fibre from the lentils and a vegetarian source of Omega 3 from the walnuts. Serve this dish with carrots and or potatoes, or with tomato chutney and pickled cucumbers. This recipe contains 100 g walnuts. Sorry, another mashed potato dish... Broad beans are in season from the end of May. Broad beans are high in potassium and protein and you can use cooked broad beans in salads, pasta dishes or omelettes. Broad beans are pretty versatile. This recipe contains 100g walnuts. Make this warming gluten free porridge with dairy free almond milk. Cinnamon is great to start the day with. Try not to use table sugar as it will make the blood sugar spike, use low GI substitutes. This recipe contains A handful of walnuts or pecans. Another Dutch 'stamppot' dish. Yes, we sure like our mashed potatoes! This is a vegan recipe but can be made vegetarian by using cheddar cheese, milk and butter. This recipe contains handful of chopped walnuts. Where can you buy real Walnuts 125g - Organic safely online? If you are wondering where you can buy Suma Organic Walnuts 125 grams safely online in the UK, then shop with us. Walnuts 125g - Organic - Suma Organic Walnuts 125 grams in Nuts and Foods.